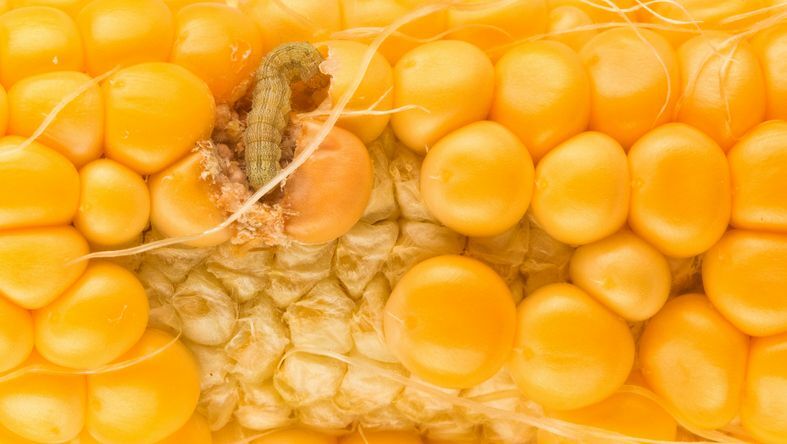 The corn earworm is incredibly detrimental to corn and soy plants across the country, in fact, it is considered the most costly crop pest in North America. The worms eat corn all summer and shift to soybeans in the winter where they lay their eggs. Young earworms live on the fruit of a plant and feed with other larvae. However, as they age they become territorial and cannibalize other larvae. Once the larvae mature they drop to the ground, burrow into the soil, and pupate. This process takes about 13 days and occurs during the summer. The adult is a moth in varied color. While they only live for 5 to 15 days they lay between 500 to 3000 eggs. Corn earworms damage a wide variety of plants from the obvious corn to asparagus, artichokes, cabbage, cantaloupes, cucumbers, potatoes, watermelon and more. Earworm larvae feed on the fruit of most plants, making it impossible for the plant to reproduce. Larvae also feed on new growth and burrow into fruit. To make matters worse, larvae often burrow into a fruit, eat briefly, and then burrow into another fruit until the entire crop is damaged. Earworms are often treated with insecticides, especially in corn fields where more than 5% of the plants are bearing new silk. However, because this pest is often treated with insecticides, many corn earworms have become resistant to a variety of insecticides. Another method of controlling earworms is trap cropping. Farmers using this method plant enticing crops around the crop they wish to protect. This encourages earworms and adult moths to feed on the "trap crops" rather than the profit crops. This entry was posted in Pesticide and tagged Maryland Pest, Maryland Renewal.